This ad was posted on February 3rd. This ad is now closed. 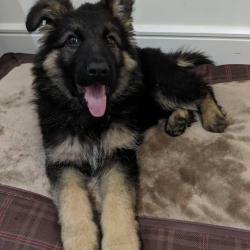 Purebred German Shepherd puppy (female), raised with children, 3 months old, wormed, vet checked, micro-chipped and fully vaccinated. Would make excellent family pet and needs to go to a good home with more space. Crate and other accessories available. Note! This ad is now closed. See other German Shepherds for sale.